Photo journal of sorts: Northumberland Day 1 - Castles at dawn, and dusk. Northumberland Day 1 - Castles at dawn, and dusk. A rather overcast start to the day at Bamburgh. Up early on the first morning of my short visit to Northumberland, and it was chucking it down with rain. I went out anyway as you never know what the weather will bring, and drove from the cottage I was staying in, through the small, twisty lanes to Bamburgh. By the time I pulled up at the seafront, the morning light was just arriving, but it wasn’t heralding the promise of better conditions. I sat there for a little while looking at the choppy surf and listening the raindrops thrum on the roof of the car, in the hope that the weather might improve. After around 20 minutes, the constant tattoo of falling water began to subside to a barely audible fizzle, it was time to get on with the day. Standing on the beach I couldn’t believe how mild the temperature was. Considering a month earlier I had been on a beach in Dorset, struggling to stay warm. The sky soon started to break, releasing a bit of colour onto the sand below. Once the rain finally eased off it wasn’t long before the clouds began to break and substantial patches of blue sky were visible. 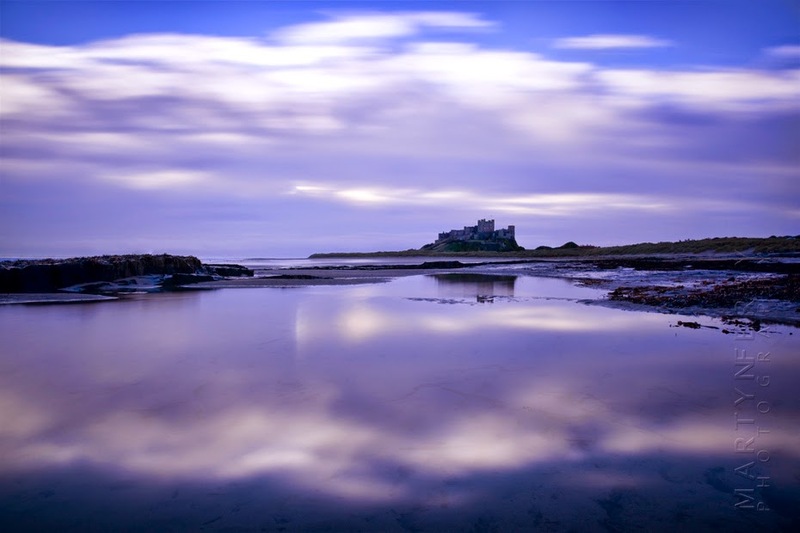 They created a suitably dramatic backdrop to the mighty Bamburgh Castle, which towers over the surrounding landscape with a powerful presence. Reflections of moving clouds in a pool of seawater. Warm light finally emerged from a very sombre beginnings. After going back to the cottage for some breakfast, I made my way slightly further down the coast to Seahouses, a popular little seaside town that has a touch of the ‘kiss me quick’ raffishness about it. It is also where the boats to the Farne Islands depart from. This time of year though most of the islands were closed, and the gale force winds didn’t make the short ocean trip look particularly inviting. I contented myself with a stroll around the small, attractive harbour, which was jam packed with boats this time of the morning, and an exploration of the myriad crab pots stacked up on the harbour walls like crustaceous hi rise apartments. The orange of the pots worked well with the blue sky backdrop. A ropy edge of a pot in close up. There were a few of these little fellows fluttering about, feasting on what they could find on the pots. After an hour or so of inquisitive snapping I was heading to Beadnell, another popular destination, thanks to its beautiful stretch of beach known as Beadnell Bay, a fine curving ellipse of golden sand backed by huge grass topped dunes. It is also a well known as an ideal location for watersports of all kind, and thanks to the gusty wind, it was teeming with kitesurfers. I watched them for a while, darting over the waves and occasionally hurling themselves aloft as their kites managed to catch a particularly strong current of air. Considering the speed they were skimming across the surf, I half expected one of them might come careening onto the beach at any moment. It was a busy old place. Every time one of their canopies cast a shadow over me as I strolled along the sand, I assumed the worst. But thankfully they seemed to keep control of themselves and their apparatus without too much fuss, and I continued on my way unmolested by man or canvas, which is always a bonus. One of them launching himself above the harbour walls. I quickly found myself on the walls of the tiny harbour, staring at the waves as they smashed themselves against the rocks over and over again. It was quite hypnotic, and despite the relentless buffeting of the wind, I stayed there for quite some time. Partly because I was engrossed in shooting the waves, trying to anticipate which ones would generate the biggest impacts, then attempting to capture them the moment they strike, yielding their energy up in one big whumph. And partly because I was enjoying the sensation of being next to the sea on a sunny day. It felt good to be on the coast again and I had a general sense of good cheer just looking at the ocean. The glimmer and shine of sunlight catching far off ripples, curling fingers of foam endlessly pushed by the current this way and that, there is something about the sea that is endlessly watchable, so I was in no hurry to leave. A few shots of the endlessly entertaining waves pounding the harbour. After a while though, it was my stomach that pulled me away from the aquatic landscape, it was lunch time, so I wandered back along the beach to the car, to fish out a sandwich. Once that was dealt with I drove to Newton-by-the-Sea, as I wanted to try and get a distant shot of Dunstanburgh Castle with a golden beach foreground. When I walked out onto the beach the wind hit me like a shovel to the face, it was roaring along the coast with even more ferocity than earlier. I didn’t hold out much hope of getting any shots, but I’d paid my parking charge so I was going to give it a go as a matter of principle. A painterly sort of image, thanks in part to the conditions. There were some nice rock formations out to sea, and I quite fancied getting some long exposures, to flatten out the waves and emphasise the rocks, but it was impossible to keep the camera steady. The wind seemed intent on hurling my tripod along the sand every time I let go of it. I soon gave up and took a wander along the wide shore scanning the sand for anything interesting. A longish exposure, and about as much as I could chance. I spotted a beautiful stone; flat, smooth and black as pitch, it’s wet, bevelled edges glinting in the sun like a chunk of polished onyx. I was keen to have it as a souvenir, so I retrieved it from the sand and walked down to the shore to give it a quick wash. I kept my eye on the sea as I wandered down, to make sure it was calm enough to approach. And I was pleased to see it was lapping gently on the sand, showing no signs of disturbance, so I confidently bent down to rinse my new prize. As soon as I did, the ocean, somehow sensing my presence, mustered itself into a minor frenzy and, well it would be foolish to say it attacked me, but that is exactly what it did, and without mercy. In an instant I was ankle deep in a briny ambush, and my trainers were soaked right through. That old ocean adage, ‘love her but never trust her’, was never more tragically true I thought to myself, as I wandered soggily away in the lonely misery of knowing I had been taught a harsh lesson. Once I had returned to the car, I took the drive north to Holy Island in the hope that sunset might allow nature to redeem itself. The island is cut off twice a day thanks to fast moving tides, and this was the only evening on my visit when it was accessible, so I was keen to take a look. The island is famous for Lindesfarne Priory, the epicentre of Christianity in Europe, thanks in part to St Oswald, a powerful Northumbrian king who is credited with bringing it to England. It is also known for the castle of the same name, which was built from the stones of the Priory, after it was ransacked by the Vikings in the 8th century. Interestingly enough, or at least interesting to me, St Oswald, is the same St Oswald who gave his name to the church in Widford, just up the road from where I live. Thanks to the story that his body rested there, on its way to burial in Gloucester. You can read all about the church in a previous blog post. The upturned hulls of old boats have been reclaimed as storehouses on the island. By the time I arrived, parked up outside the village and walked to the castle, the light was starting to warm up, but there wasn’t a cloud in the sky, which was a bit boring. I took a few shots of one of the upturned boats that now serves as a storage building, before walking along the rocky bay towards the castle. Looking away from the castle towards the mainland, to the last of the evening sunlight. I spent an hour or so trying to get some pictures, but I couldn’t get a composition I particularly liked, plus the relentless hammering of the wind was making the whole process a real chore. The sky in the end turned slightly pink as the sun dipped below the horizon, but nothing breathtaking, and to be honest I was glad to pack up and leave, my head was pounding. someone strolling into the shot. A final display of light in the clouds before darkness began to descend. On the way back I stopped to watch a small flock of starlings swoop and wheel about the sky above me, flicking through the air in unison, like a formation of ballerinas at the climax of a performance. Once they had disappeared into the horizon, I carried on, and the thought occurred that I should have gotten my hair cut before I travelled north. Thanks to the wind I had the unnerving look of an insane professor, and not in a good way.